This is such an important lesson I’m splitting it into the recipe and a post on WHY you should look at certain numbers differently when you choose snacks. And don’t dismiss this post if you are a normal weight. This information is important for everyone, heavy, thin, and in-between. I sometimes eat granola (NOT every day, but a few times a week). Why? 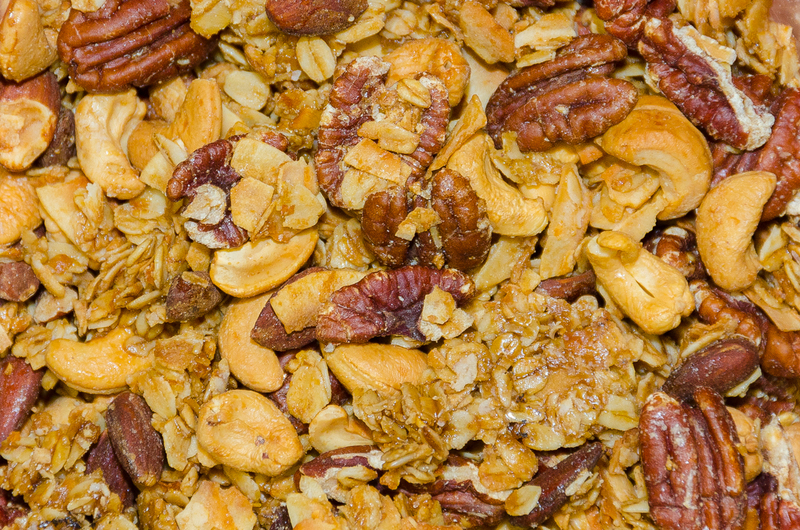 Granola is healthy and has a lot of FAT. Why is that good? SATIETY. That is the feeling you’re full. The feeling that you don’t need to go raid the oreo package taunting you in the kitchen. The feeling that you’ve had ENOUGH. And when any of us are trying to eat healthier and/or lose weight, satiety is paramount. You cannot go months and months feeling like you’re starving. And I’m going to tell you that it is REALLY important to eat good fats. REALLY IMPORTANT, as in ESSENTIAL. Let’s take a look at how I make Granola — and I make it so I can control what is in it and to save money. Granola is incredibly expensive in the store, and incredibly EASY to make. Here’s how I do the base of the mixture, you can create your own version by adding your favorite nuts and/or dried fruit. (see below on why I don’t add dried fruit). Pre-Heat oven to a LOW 275 degrees. Hotter and the nuts will scorch. Makes about 20 servings — this is a SNACK, not a portion the size of a bowl of cereal. 1/3 cup. 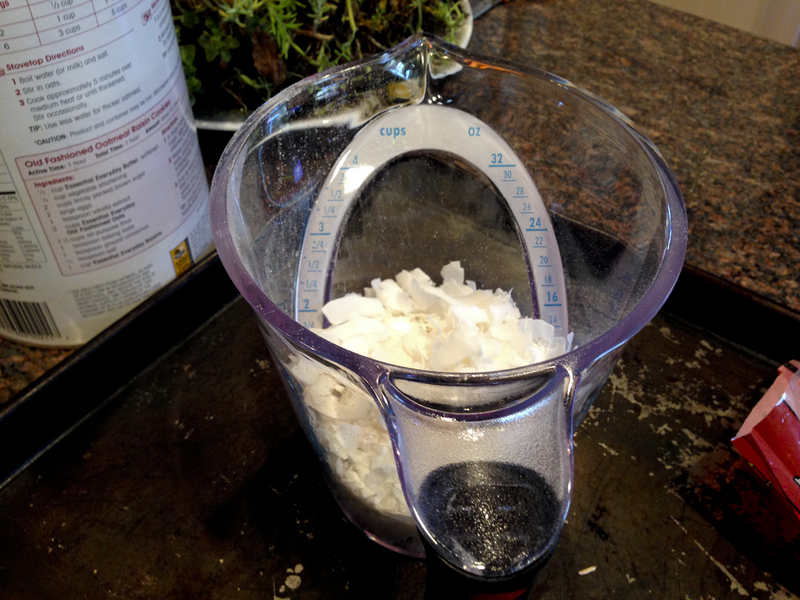 Use a large mixing bowl, as it gets messy and you have to toss it like a salad with the wet ingredients. 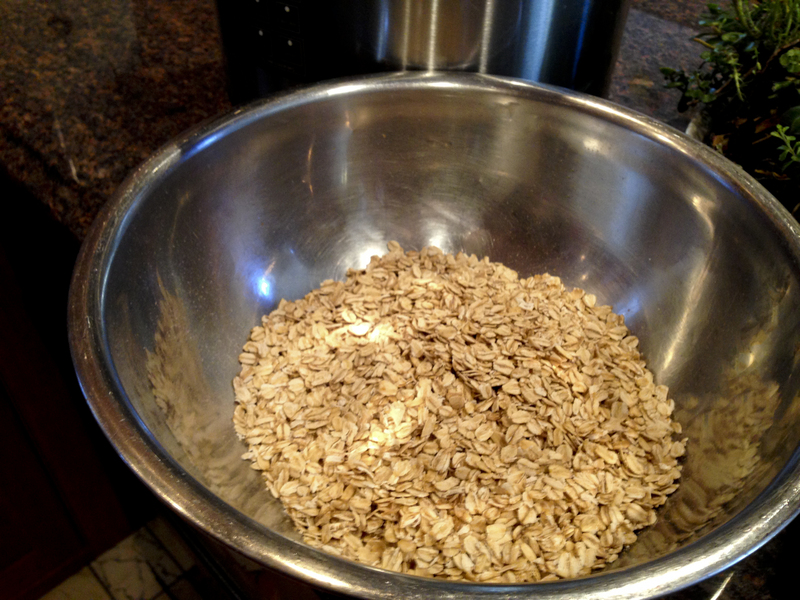 Put the 2 cups of oatmeal in a large mixing bowl. As you can see, these flakes are BIG. 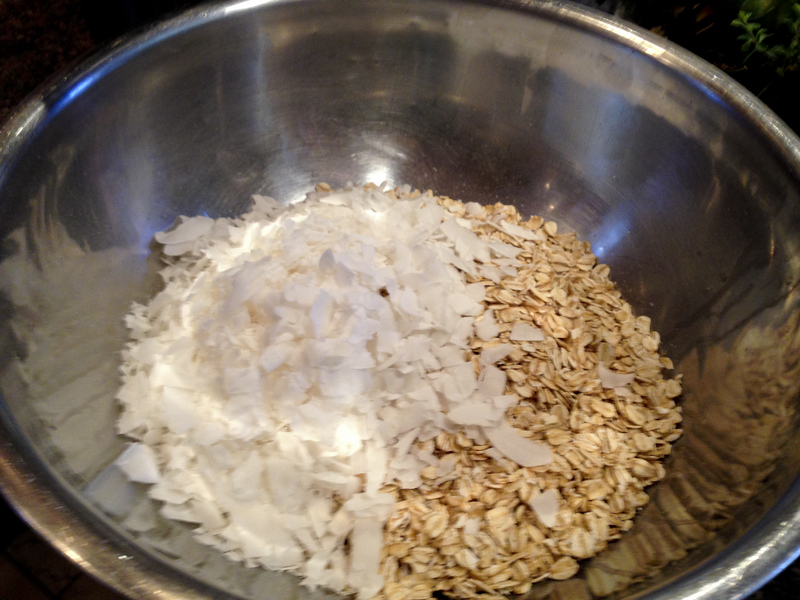 Combine oatmeal with the coconut and mix. 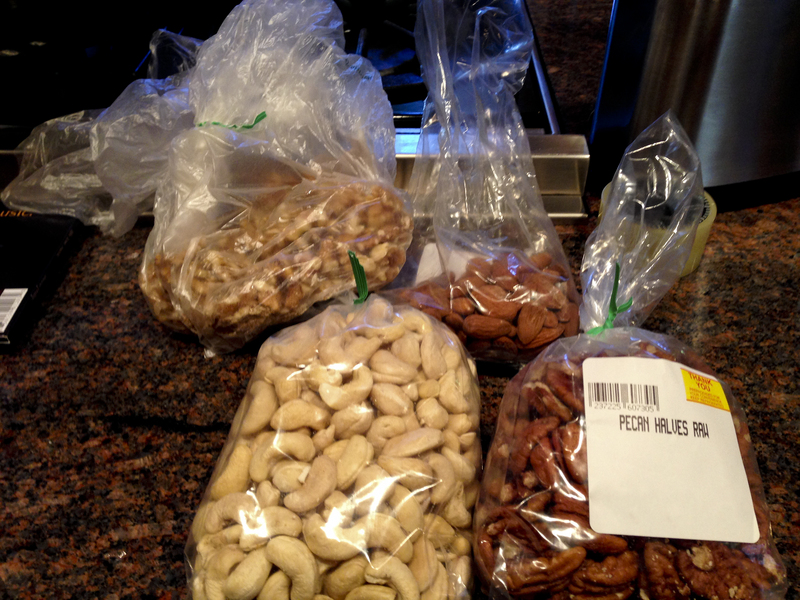 I used cashews, pecans and almonds in this batch. I try and buy organic in bulk to save money. Add in the nuts you want. Mix them all together. Then, combine the melted coconut oil, the vanilla extract and the maple syrup and the oatmeal/coconut/nut mixture well, it will be wet and sticky. 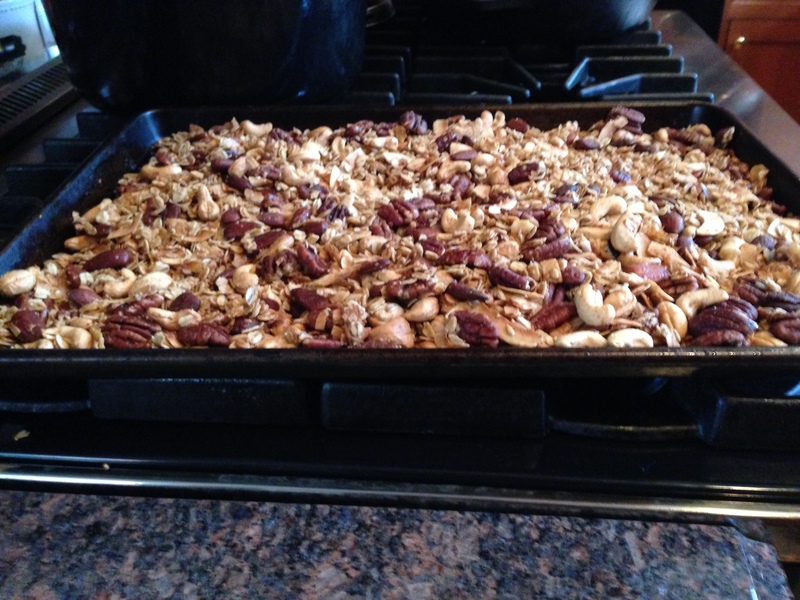 The mixture of granola ready to go onto the jelly roll pan. Lay it on a heavy jelly roll pan (a cookie sheet with sides). The heavy ones don’t warp and heat evenly. A baking pan will do, you want to spread it out thin, so that it is a single layer. Sprinkle the salt evenly over the top. You want the coconut and nuts to turn light brown. Keep a watch, it can turn fast! Take it out and use a spatula to scrape it off the pan. When cooled completely, put in a airtight container so it doesn’t lose it’s crunch. Dark chocolate can be added when it is cooled slightly, but be sure it is above 70% cocoa, otherwise it will have too much sugar. 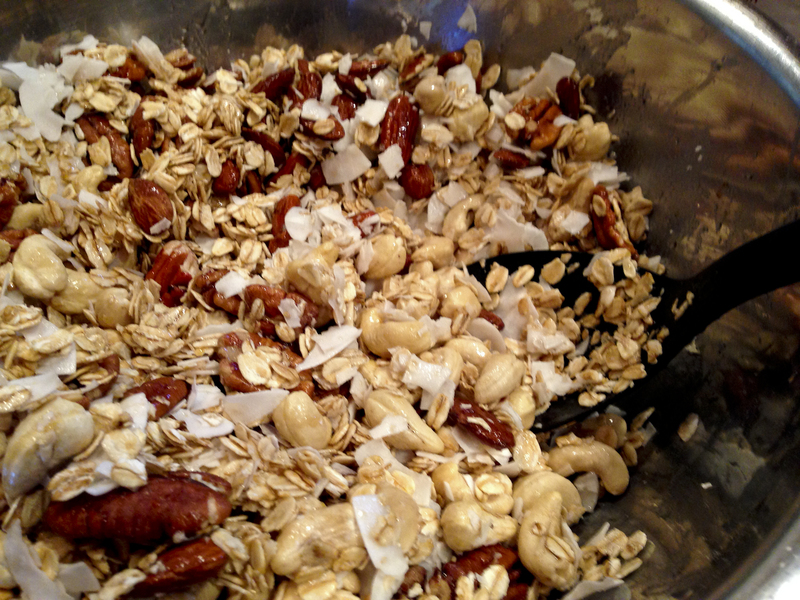 Change the vanilla to almond extract for an almond inspired batch of granola. You can use stevia, but due to it’s chemical makeup, you will not get the stickiness and binding property you get with maple syrup. I personally have never tried it. PART II: WHY THIS IS BETTER THAN MOST OTHER SNACKS! So, you might look below and be astounded by the calories and fat in this. Our old conventional wisdom is that a lot of fat is BAD. Read more here why you should be eating fat, and what kind to eat. What you SHOULD be paying MUCH more attention to, is the GLYCEMIC LOAD of the food. EVEN IF YOU ARE THIN. This is basically what the food does to your fat storage and insulin levels once you digest it. High Glycemic Load = High Insulin Response = FAT STORAGE = Weight gain. (For thin people, they develop fat around their organs and a fatty liver, all which predispose us to more chronic illness and shorter lifespan). (Read what a “skinny fat person” is here). And your insulin level going sky high will only make you HUNGRY much sooner than you want. Ever eat a carton of yogurt thinking you were having a “healthy” snack, and realize that you need to eat again in 1-3 hours? 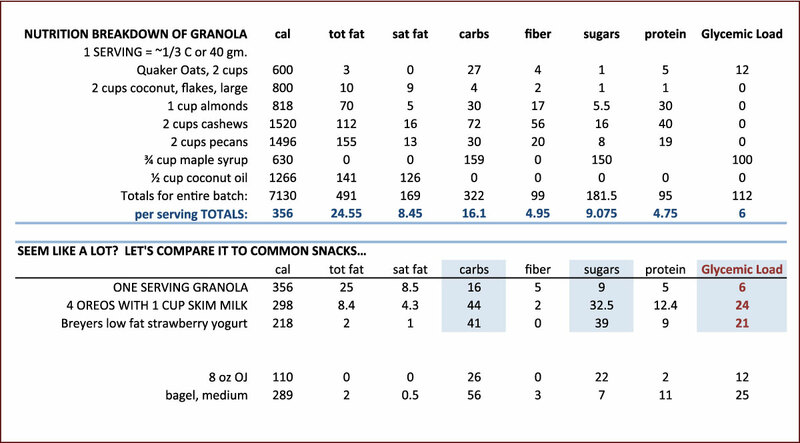 Well, look below at the nutrition make-up of the granola as compared to a carton of yogurt, and check out the: carbs, sugars and glycemic load for the foods I have listed: (Granola, OJ, Yogurt and a bagel). Read more about glycemic load/index. As you can see from above, the carbs and sugars in both the yogurt and oreos with milk are much higher. The glycemic load is less than 10 in the granola, which makes it a good glycemic food to eat compared to what we think of as “healthy” snacks like juice, a bagel or yogurt. Finally, I don’t want to imply that there is anything magical about Granola. Having an apple with peanut butter, or hummus and veggies are also GREAT snacks. And they will have lower calorie/fat counts. (Remember, every time you eat, whether a meal or a snack, INCLUDE a PROTEIN source.) But, you CAN enjoy treats if you do it carefully and you know what’s in the food. Next PostNo Pop. No Soda. Ever.